We are a leading Manufacturer of methoxyethyl cyanoacrylate adhesive from Delhi, India. Usage/Application Cosmetic field like false hair wig,nail paint,eye lash glue formulations. 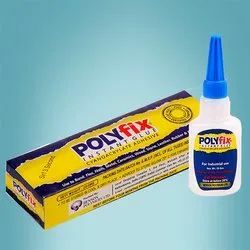 POLYFIX methoxy-ethyl cyanoacrylate adhesive is solvent free low odour ( no odour) clear liquid with low blooming ( no whiteness after cure) qualities. The use is widely in cosmetic field like false hair wig, nail paint, eye lash glue formulations.